Won't the crab nets float away when tied to a buoy? The reason I ask is it would be very convenient to set out say 6 of them to be checked occasionally while fishing an area. I watched a guy use this technique along a shallow muddy bank where there was no pier or anyplace to drop the nets from or tie the nets to. He used empty plastic water bottles as floats and he tied one to each crab net. He threw down 5-6 nets within a few feet of the bank and checked them periodically. Used a stick to nab the floating bottle and pull the nets in. The water bottle float technique was very clever. There's no issue of legality with these nets or of tying them off to a float. But I wouldn't leave them unattended for more than 10 minutes if I was in an area I knew crabs were prevalent. Two or three crab will strip a chicken neck of meat in 15 minutes and that net has no means of making them stick around. I tried to do what you are talking about. I made up 10 with crab trap balls.. I usually crab when the current is moving and they kept flipping over and tangling up. Make sure to put a gear tag on them .. I can see that could happen, so I think I'd try to crab in areas with some, but not too much, current. Also, a weight added to the buoy line could anchor the buoy without putting tension on the net. And, yes, I'd add a gear tag to the buoy. Thanks for all the input. I think it's worth a shot. We'll see once the weather warms up. 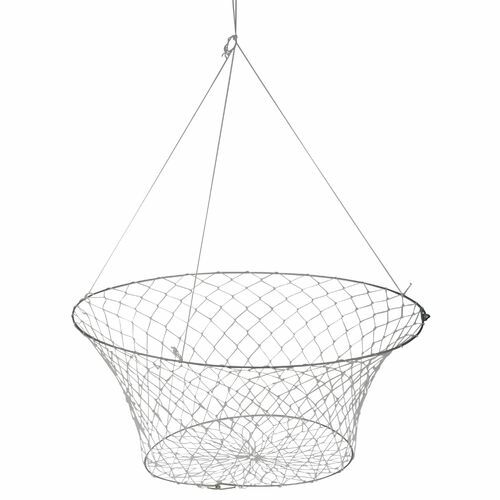 Growing up, we tied a couple of 1oz pyramid weights to the bottom of the nets to keep the nets down. I’d bet that a couple of 1oz weights tied to the big upper ring instead, would suffice to counter the wind or current pull of the bouy, especially if it is a small bouy like a water bottle. Only need enough bouy to hold the net line, not a rope. It would be nice to go home with a dozen big blues now and then. Crab are virtually everywhere that we fish. Need to look at the size and limit info now. Last edited by habanerojooz; 01-22-2019 at 01:43 PM. The rings are usually partially weighted by the ring being made out of steel and plastic coated, but they do not weigh very much. But they lye flat on the bottom so currents are only pulling on the line and buoy. Use one float and don’t leave them unattended because they can float off or get seaweed on the float and start moving, if you have currents down there. And pull them often. At least every half hour.